Despite their best efforts, trial judges occasionally make mistakes. In such situations, it may be prudent for a litigant to file a civil appeal with the North Carolina Court of Appeals. Pursuant to Rule 3 of the North Carolina Rules of Appellate Procedure, a “Notice of Appeal” must be filed within very strict jurisdictional time limits; failure to timely file a Notice of Appeal will likely result in dismissal. Therefore, it is important that you immediately consult an appeals lawyer after an adverse ruling. You may reach the Raleigh appellate attorneys of Maginnis Law at 919.480.8526 or by sending a confidential email via our contact page. The appellate process in North Carolina is extremely detail oriented; strict adherence to the Rules of Appellate Procedure is required. As indicated above, a civil appeal is initiated by filing a Notice of Appeal with the trial court. The next step is time-consuming process of creating the “Record on Appeal.” The Record is a highly organized collection of pleadings, orders, judgments, transcripts, and other trial documents which allows the Court of Appeals to understand what has happened in the case. 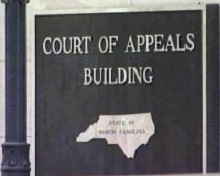 After the Record of Appeal has been settled in accord with Rule 11 of the North Carolina Rules of Appellate Procedure, the appellant (party appealing) must file it with the Court of Appeals. The appeal will then be placed upon the docket of the Court of Appeals. Next, the appellant will submit a “Brief” which sets forth its legal arguments in favor of reversal. The appellee (party responding to appeal) will then submit its own Brief in opposition to that of the appellant. In certain case, the appellant may be allowed to submit a second “Reply Brief.” The Court will then choose whether or not to hear oral argument. Rule 30(f)(1) of the Rules of Appellate Procedure allows the Court to dispose of the case “on the record and briefs” if it does not believe oral argument will be of assistance. The Raleigh appellate lawyers of Maginnis Law are conveniently located just blocks from the North Carolina Court of Appeals and Supreme Court. We offer free consultations for all clients, including those considering their appeals options. As a small law firm, we have the flexibility to represent clients under a number of billing arrangements. Many of our clients enjoy our “flat rate” option, whereby we handle a case in stages with a defined amount due at each stage. It allows our small business and individual clients to effectively control and predict legal fees. The Raleigh civil litigation firm of Maginnis Law represents individuals and businesses throughout the Triangle area, including: Raleigh, Durham, Chapel Hill, Cary, Morrisville, Wake Forest, Apex, and Clayton. Our civil appeals lawyers may be reached at 919.480.8526. Alternatively, you may send a confidential email inquiry via the form on our contact page.